Written by Sarah Streitwieser on October 2nd, 2018 . In last weeks’ blog entry I mentioned that somehow between many “failed” rosary praying attempts and regimens, I began learning this one simple fact: the mysteries of the Rosary are not something that we are meant to master. Rather, we are called to enter into them and to let ourselves be mastered. But what exactly does it mean to be mastered by the mysteries of the rosary? 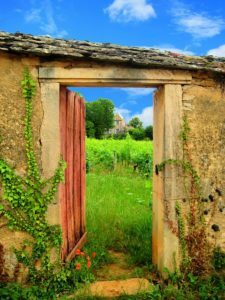 How are we invited to truly enter in? St. Ignatius encouraged others to prayerfully enter into Christ’s life by imagining His life events from different perspectives. One may enter as another person explicitly involved in the scene, as an unseen observer from a distance, or even as an inanimate object (i.e. one could imagine being the hay in Jesus’s manger). St. Ignatius encouraged silence, and for meditation to sink deep rather than spread broad. Considering the mystery of the visitation we may contemplate: What does it feel like to be Mary, perhaps nauseous in the early stages of pregnancy, traveling a far distance by foot? What is happening in the heart and mind of Elizabeth as she enters the late stages of pregnancy at an advanced age? What does it feel like or what happens when John is filled with the Holy Spirit? Imagine the perspectives of John the Baptist of even Jesus, experiencing the visitation in utero. Or perhaps imagine yourself as Zechariah, witnessing such beautiful displays of faith in total silence. Entering into the mysteries of the Rosary is ultimately a grace that comes by way of asking, not by forcing or trying harder. “Seek and you will find; knock and the door will be opened” (Matt 7:7). Repetition may prepare your heart for receptivity, but ultimately it is Jesus who teaches and God who causes growth. If you are want more in-depth resources, meditation suggestions, or discussion questions, click the link below. 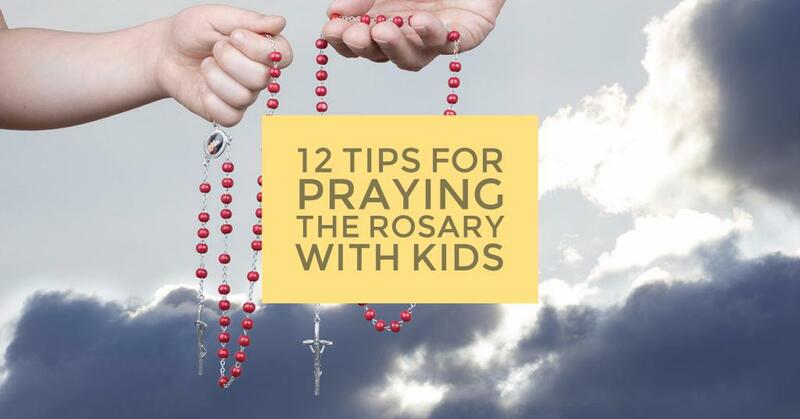 Don’t forget to share your experiences in praying the rosary with your family! Written by William O'Leary on October 1st, 2018 October 8th, 2018 . October is the month of the Rosary, with the feast of our Lady of the Rosary occurring on October 7th (which also happens to be the first Sunday of the month this year). This is a precious time to grow in our devotion to Mary as the Queen of the Rosary and, through the mysteries of the Most Holy Rosary, to come to know and love Christ our Savior. In honor of the Rosary, we are putting a challenge out to the Ascension community, to get as many families as possible to pray the Rosary. If your family can commit to one Rosary, that’s great. If you can commit to more, even better. 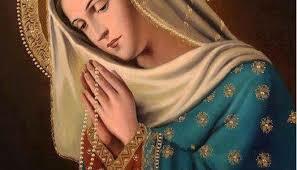 The point of this challenge is just to pray the Rosary as a family. The power of prayer knows no limits. Thank you for signing up and may God bless you abundantly. Read the article What’s so Mysterious? Written by Sarah Streitwieser on September 18th, 2018 .
wasn’t until I was well into my journey of learning to pray the Rosary that I discovered that each mystery is associated with a spiritual fruit. I think that I first noticed them listed in a “How to Pray the Rosary” pamphlet – probably something that I had casually picked up from the church vestibule. Written under each of the 20 mysteries was a specific spiritual fruit. In this particular pamphlet there was no instruction beyond this. As a convert to Catholicism, I had initially found the layered praying experience of the Rosary to be a touch overwhelming. This may seem entirely second nature to a cradle Catholic, but for me, the idea of praying one set of prayers (Hail Mary, Our Father, etc.) while meditating on something else (i.e. the annunciation), initially felt dizzying and mainly impossible. To be honest, I had no idea why any given virtue was associated with a particular mystery of the Rosary. Furthermore, I wasn’t totally certain what I was supposed to do with these virtues. In the example of humility and the annunciation – was I supposed to look for the virtue of humility demonstrated in the annunciation Bible story? Could I mystically obtain the virtue of humility just by praying the Annunciation? How many times did I need to pray to be truly humbled? As with much of my Catholic experience, I have found that my initial questions – while honest and well-intentioned – are not ultimately the questions whose answers I most deeply seek. The answers that I truly want are not something that can be neatly printed in a pamphlet or answered with a simple response. Rather, they are answers that come in pieces, slowly with repetition and prayer. This is your invitation to continue the Rosary Journey with your family (with your Parish, and with me, too!). You can check out the Rosary Encounter on our social media pages or in the bulletin. Try praying it with your spouse or with your kids. You can also come here to find additional resources and something new each week. Click the link below for materials on meditation and discussion. Written by Sarah Streitwieser on September 11th, 2018 . As a child I thought that pie crusts only came in preformed aluminum pie plates. 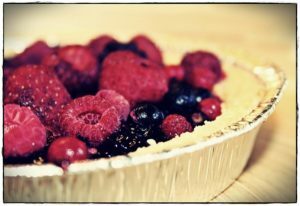 It wasn’t until my late teens that I first tasted a true homemade pie. I was immediately smitten. As a young adult I decided to learn the art of pie making myself. I looked up an old fashioned pie crust recipe and was excited to see how simple it was. Just 5 ingredients: flour, salt, butter, shortening, and water. Easy peasy – or so I thought! I began learning then what I am still learning today. Sometimes the recipes that appear to be the simplest are actually the most complicated. The discretion of using just the right amount of ice water, the finesse of cutting the fat evenly into the flour without overworking it, and of knowing which pie recipes would benefit from sneaking a few pinches of sugar into the dough – all of that can only be learned through experience and repetition. I am a much better pie maker than I was when I first started, but even so, sometimes my pies still don’t turn out just right. I did not grow up praying the Rosary. Perhaps you did? Maybe your childhood memories of praying the Rosary seem cold and distant – a sort of endless monotony that you were forced to endure. Perhaps you have memories of praying with your family as a young child, wrought with youthful mysticism and warmth that you long to return to as an adult. Regardless of what your childhood Rosary experience was, it seems like the practice of praying the Rosary is something that is often pushed aside or pushed through, not something that is fully embraced. When I learned to pray the Rosary as an adult, I approached it like a pie crust. Just a few ingredients – easy enough! Now say these prayers, now these, now meditate on this. 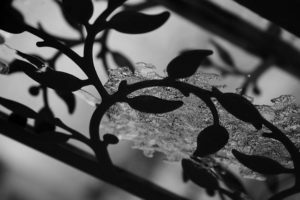 The only problem was, I was missing all of the finesse – all of the warmth and joy (and sorrow and shared suffering) that comes from repetition and experience. As Catholics we love to talk about our Rosary devotions. We have Rosaries in the adoration chapel and in the back of our church; we give them as confirmation, first communion, and baptism gifts; we have family rosaries, Rosary groups, and Rosary podcasts. These are all wonderful resources, but often they do not help us get past the “ingredient list” method of praying. The Ascension Family Life ministry wants to challenge you to enter into praying the Rosary a new way. Hopefully you have already seen the Rosary Encounter on our social media pages or in the bulletin. That is a short, weekly challenge that is meant to be shared/prayed with your family. 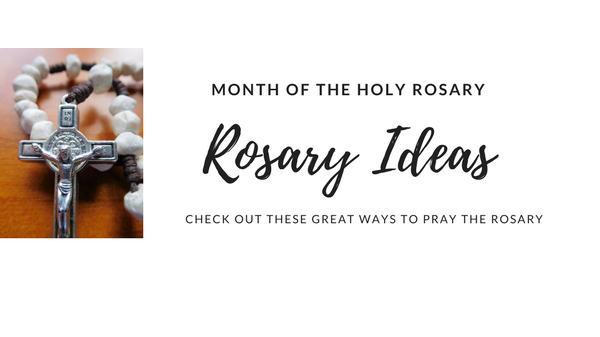 In this blog, you will find additional Rosary resources that can supplement your journey as you enter into praying the Rosary and meditating on its mysteries in a new way. Click the link below for additional materials for meditation and discussion. And come back next week for something new! Written by Ray Martin on August 29th, 2018 December 5th, 2018 . The Archdiocese remains committed to investigating any allegation of abuse of a minor made against any member of the clergy or any church employee or volunteer — no matter the age of the incident or the current age of the victim. Individuals are encouraged to call the confidential report line at (913) 647-3051 (or visit archkck.org/reportabuse) to make a report to Jan Saylor, archdiocesan report investigator, and to call law enforcement directly. If a child or vulnerable adult is in immediate danger, call 911. Written by Ray Martin on December 13th, 2017 December 18th, 2017 . Every year my brother and I exchange a phone call on Christmas to say, “Merry Christmas, $h!tt#r’s full!” Christmas Vacation is one of our favorite movies and we grew up watching it together every year. My kids and I quote the movie year round! I love the opening scene where they go to get their tree out in the woods…decorating the house with too many lights, having the big sit down dinner, waiting on the holiday bonus, etc. I think that a great point is raised by Clark’s extreme nature in that we tend to do some things each year just to do them or because it’s what we’ve always done, but in reality they may not be all that healthy for our family. So in the great Griswald family tradition we’re gonna discuss…drum roll please…drum roll…rituals! Written by Ray Martin on December 6th, 2017 December 7th, 2017 . If someone told me that there was a simple solution out there that relieved anxiety, fear, depression, and was known to strengthen my marriage to the point that it was less likely to break down, I’d be like, “how do I buy a bottle of that?! ?” The truth is that it’s not a pill or product, but rather an uncomplicated thing that we all can do: pray. Prayer is a powerful tool. In this final installment of The Marriage Shield we come to the third F: Faith Devotion. Previously we covered fidelity and fiscal stewardship, but faith is the magic ingredient that has such a profound influence on our behavior that it guides our choices to be faithful to our marriage and responsible stewards of our finances. In The Choice Wine Steve Bollman’s father-in-law, Riley Leggett, advised him to sit with his family in church every Sunday. This wisdom has a profound impact on a family. Couples attending weekly church services have a divorce rate 60% lower than those who never attend church services. Why? Because going to church changes the behaviors that lead to divorce: infidelity, using money foolishly, and substance abuse which all decrease significantly when you regularly worship with your community. It reduces anger, fear, and anxiety. Makes one more empathetic and compassionate. Strengthens a person’s sense of self. Leads to lower levels of loneliness, depression, anxiety; less substance abuse. Prayer changes you, which changes your marriage. Couples who don’t cohabitate prior to marriage and are faithful reduce the likelihood of marital breakdown from around 30% down to only 11%. This is why infidelity is the greatest threat to your relationship. Attending weekly worship drops the rate to 9% and praying daily takes it down to 5.9%. Many who are fiscally responsible have earned a certification or bachelor’s degree and combining that with fidelity and faith brings the probability down to nearly zero. Considering that the foolish use of money is the second leading cause of marital breakdown it makes sense. Faith is that intangible spirit that changes us into better spouses. I hope that you will take the three F’s to heart and think about the wisdom shared by Riley Leggett that we should be eating with our family each night and going to church with them every Sunday and I can’t stress enough how important it is to be engaged in your church community who is here to cheer on your family life. Change and habits are hard to break, but little changes every day will keep you on the path to a lifelong, holy marriage. Written by Ray Martin on November 29th, 2017 December 6th, 2017 . I’m one of those cheap people, like I don’t usually drink soda at a restaurant because I can get it cheaper at the store (and let’s be honest, I don’t need the calories!) I love buying used stuff on Ebay or at Pawn Shops. I drive a car that was wrecked and rebuilt. I eat most meals at home and bring groceries to my office on Monday to make sandwiches all week for lunch. I even cut my own hair…well what’s left to cut. It’s not that I’m broke, I just don’t like wasting money on things that that I can get for less or do myself, but who knew that being cheap could be good for your marriage? In case you missed our introduction to The Marriage Shield, you can go back and read or watch it to get an idea of why it’s important to keep a relationship together and what it takes to do so. In our last episode on fidelity, we discussed our vows one of which applies to this topic “for richer or for poorer”. Today we will focus on the second of three “F’s” in protecting your marriage, fiscal stewardship. Financial stress is the leading cause for tension in a marriage, especially for newlyweds as they try to navigate this new blending of income and spending. According to a study published in the Journal of Marriage and Family, using money foolishly is the second leading cause for women to end a marriage tripling the likelihood of marital breakdown. Even though it’s not as big of an issue for men, misuse of finances is a top cause of tension in a relationship. So when we talk about keeping a marriage together for life, fiscal stewardship is a priority because not being responsible with your money is a serious threat to a relationship. Credit card debt, car loans, student loans, and medical expenses are the four areas of preexisting debt that cause stress. The top purchased categories on credit cards are clothing, gasoline, eating out, and travel which are consumable goods and therefore not the best choice for debt which should really be used in cases of investments like a home or an education. 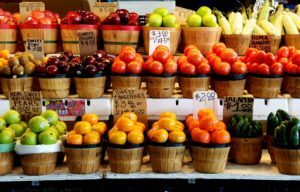 Brain imaging reveals that when a person considers buying something a reward is anticipated in the circuitry of the brain, but when considering paying for the purchase a pain region is anticipated. Credit cards were designed to delay the activation of the pain in our brain until after the purchase is made. The problem for a marriage with all of this is that studies indicate that debt and financial stress lead to lower levels of marital satisfaction and increase levels of marital discord. Needless to say, debt is a threat to marriages, but Americans continue to accumulate debt at historic levels. The average full-time worker in the U.S. works approximately 47 hours per week and just over 1,700 hours per year. Riley Leggett’s wisdom about eating dinner with your family every evening is very difficult to do with that kind of workload. 69% of workers check their work email before going to bed. 57% of teenagers eat dinner together with their families at least five nights a week or more. The average worker spends an additional seven hours per week working from home. Technology has given us an unprecedented challenge making it all the more important to be intentional in balancing our professional and domestic worlds. Half as likely to have parents who do not know their children’s friends well. Our brains are wired to be charitable. We receive a reward in that same circuitry that guides us to buy something when we give. People who are charitable tend to be happier and healthier than average. The more that we save, the more that we can give. Riley Leggett was onto something with this eating with your family philosophy because over an 18 year period skipping one night out of fast food would save you over $37,800 which could equate to an average four year tuition at a state university. Give the first fruits of your labor to God recognizing that all we have is a gift. Keep $8 in your wallet that you must give away. Moderate your consumption of media. Not only will you save subscription costs, but it’s full of advertising propaganda on all of the things you just have to buy! Cut up credit cards until they are paid off. Reduce entertainment expenses by eating more meals at home and enjoy nature as recreation. Begin saving and gradually increase the amount. The way we manage spending and finances have tremendous influence on the success of a life-long marriage. Debt and working too much causes stress and tension and limits our ability to spend time with our children which has an exponential effect on their success. Making sacrifices by not buying things that are outside of our means and eating more meals together with our family will greatly reduce the risk of marital breakdown and increase the joy in your family which is why Fiscal Stewardship is the second F of The Marriage Shield.